Pickup truck popularity is at an all-time high. They are everywhere and driven by all types of people. And let’s face it, a lot of the marketing of these great new pickups is built around the concept of their “Off-Road Package.” This idea sounds rugged and adventurous, but honestly, what does it even mean? With a lot of these pickups, you see stickers with alphanumeric names followed by the tag “Off-Road Package.” Sure, it sounds good and fancy but what’s actually part of the package? In other words, how do TRD, FX4, and Z71 differ from the other? More importantly, are they worth the added money? First, there’s the 2019 Chevrolet Colorado’s Z71. What you get with this truck is upgraded hardware. It enables easier handling of rough roads. The hardware also includes a suspension with stouter springs and dampers, all-terrain tires, and automatically locking rear differential. There’s also a skid plate to absorb blows to the undercarriage. This vehicle also offers some features unrelated to “off-road” driving. Included among these are damped tailgate, automatic climate control, and wireless smartphone. At the same time, this truck doesn’t offer some features of other off-road packages. Examples are, it doesn’t provide a selectable traction control interface or driver-controlled differential lock. 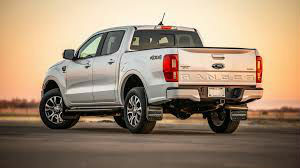 Now, compare the above truck to the 2019 Ford Ranger FX4. This Off-Road package is more basic. The features of the FX4 package center solely on improving off-road capability. There are no perks unrelated to off-roading. This package includes revised springs and dampers, rugged all-terrain tires, three skid plates, exposed front tow hooks, an electronically locking rear differential as well as the terrain management system. Plus, the interface enables the driver to select among four unique terrain modes. Each mode has preset mappings of throttle sensitivity, transmission shift data, and traction control calibration. Even better, this package provides Trail Control, a low-speed cruise control for difficult surfaces. Experts agree these “Off-Road” packages offer similar features that do aid in going “full rugged” with your trucks. Even better, by choosing these packages the overall functionality of the trucks is generally not compromised. Therefore, most truck experts agree it’s a smart choice to invest in these packages if you can afford the extra pricing.